Free Clipart, Vintage graphics, and 3D images for your creative Designs! Enjoy our eclectic collection! Decorating Tree Clipart. Click the image to view and download the full-size version. 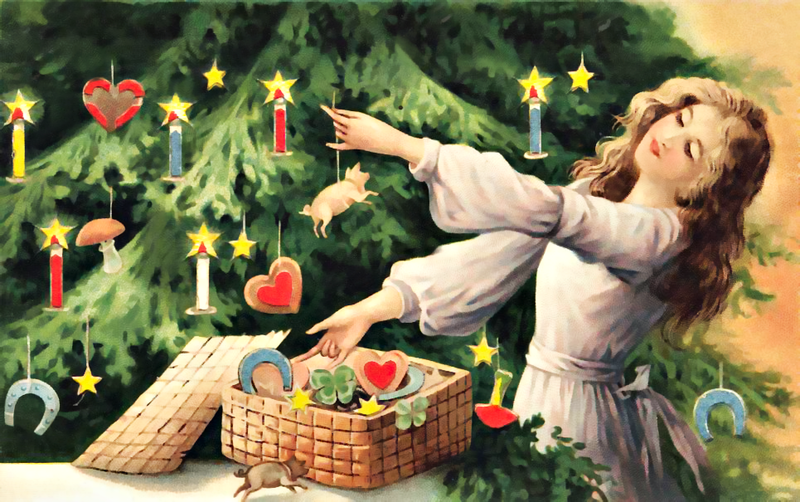 This vintage image shows a woman decorating a Christmas tree with hearts, candles, shamrocks, and pigs. The postcard was in very bad shape, but I’ve retouched it. Who couldn’t love the expression on this lovely lady’s face? She’s like a holiday Mona Lisa. Some of you are probably wondering why she’s decorating the tree with pigs. You will find such a theme in many vintage illustrations and greetings. The pig, like the shamrock, used to a popular holiday symbol in Europe and America, representing luck, success, and prosperity–something we’d all like for the year ahead. It’s little wonder then that pig was often used in holiday decorating and postcards for Christmas, New Years, and Easter. This concept is also expressed in the tradition of serving ham for Christmas and pork for a New Years feast–it’s thought to bring good luck. Though the shamrock continued to be a symbol of good luck and prosperity, it’s holiday use is now primarily limited to Saint Patrick’s Day. Unfortunately, the pig has practically lost its popularity as a symbol of good luck in modern times. You won’t see its likeness hanging on the door with a Christmas bow, but the pig is still served up for Chrismtas dinner in millions of homes. So if you want to do some really unique decorating, consider the pig this holiday season. Actually, they are kind of cute with a Christmas bow. If you’re new to ClipArtPlace, welcome. Please feel free to browse my rapidly growing free graphics collection. To the right, you’ll find the categories. Graphics are my passion. I have a huge collection of vintage images, and I’m adding new vintage and modern clipart each day. So drop by often for graphics that you can use in your crafts and design projects. My Terms are liberal. If you’d like to know more about my mission for this site, please Click here. This entry was posted in Christmas Graphics and tagged Christmas clipart, Christmas pig, Christmas Tree Clipart, Decorating Tree Clipart, graphics, holiday clipart, royalty-free, stock image on October 4, 2014 by Noel Bryan.